To present chamber music concerts in an ideal setting performed by top ensembles from the Bay Area, across America, and around the world. To educate our audience through pre-concert talks, post-concert Q & A, program notes, and meet-the-composer experiences. To educate students in chamber music by presenting outreach by some of our ensembles for San Jose public schools, and by arranging performer residency activities for San Jose State University music students. To support chamber music in our region by publicizing other nearby chamber music concerts, cooperating in marketing with fellow presenters, and presenting joint programs with The Ira F. Brilliant Center for Beethoven Studies, San Jose State University. Chamber music is classical music for two or more performers, played one-on-a-part with no conductor. In 1986 Lawrence Bryan and friends founded SJCMS so that South Bay audiences could enjoy a quality professional chamber music concert series here in San Jose. All concerts were presented in the rotunda of the nearby First Unitarian Church until 1993, when our audience outgrew the church's capacity, and the Trianon with its ideal size and acoustics became available. Since 1994, all of our concerts have been in the delightful 318-seat Trianon Theatre, which audiences, critics, and performers acclaim an acoustical gem and the Bay Area's ideal hall for chamber music. We provide music appreciation, experience and education. Audiences attending our concerts receive pre-concert talks, informative program notes and frequent post-concert discussions with the artists. Each season we teach chamber music appreciation to the students of several public schools in San Jose by engaging some of our professional chamber music ensembles to present discuss-demonstrate-and-perform programs for assembled classes -- presentations which delight students and receive teacher praise. 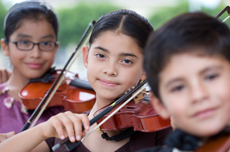 In prior years we presented our chamber music education for school students at the Trianon for classes whose attendance was arranged through the City of San Jose's former "Arts Express" Program. Our volunteers make each season concert happen by helping in many ways, such as: concert production, education, concert publicity and mailings, professional services, and board membership. We love our volunteers! Would you like to join this team? To tell us of your interest, just Contact SJCMS or note it on a ticket order form. Income from ticket sales covers less than 50% of concert expenses. Your tax-deductible contribution to the San Jose Chamber Music Society helps ensure that you and your community will continue to enjoy educational programs and concerts of the highest quality. As a donor, you will be listed (if you wish) in each program book of the season. Additional benefits are available for corporate sponsors. Contact SJCMS for more information on individual and corporate donations. You can also include a donation with your ticket order. Some employers will match your donation to a non-profit organization. Please check with your company to find out if you can double your gift to SJCMS. Thank you for your patronage and support. SJCMS is supported in part by a Local Arts Grant from Silicon Valley Creates, by a grant form the Ann & Gordon Getty Foundation, and by a Cultural Affairs grant from the City of San Jose. We welcome grant and business donations and referrals. The San Jose Chamber Music Society actively works with other arts organizations by regularly listing chamber music performances of South Bay area musical organizations in our programs, by co-sponsoring concerts (such as with the Ira F. Brilliant Center for Beethoven Studies), and by exchange of expertise and marketing information. Visit our page of information about other chamber music presenters in the Bay Area.